Maybe, when this is all over, I should start publishing a diary written 343 years in the future. @louloulou I wouldn't want to wake him up - he looked so peaceful! Doing the usual weekly history hacking. Well, history hyperlinking. @maxgadney I almost expected today's Guardian headline to be "It's the Guardian wot won it!" 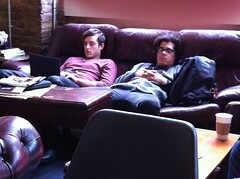 Hipsters Hogging Sofas, coming to a Tumblr near you soon. @ianbetteridge Estate agents should have it as a feature: "3 receptions, 3 beds, two baths, 50' garden, freehold, Bunga Bunga room." Phew, got all the Samuel Pepys data prepared and explained: http://www.pepysdiary.com/export/json/README.html @historyhackday Have at it! @Jamiec Ha, yes, I was flicking through @WiredUK thinking "It's quite good actually," then found that article and put it down quick.